Nursing homes with higher proportions of Black residents do worse financially and deliver lower-quality care than nursing homes with few or no Black residents. Black nursing home residents use Medicaid at disproportionately higher rates than White nursing home residents. De facto segregation may exist in nursing homes due to geography and resident selection based on payment. Nursing homes with a higher proportion of Black residents perform worse financially and provide lower-quality care than homes with few Black residents, finds a new study in Health Services Research. The study’s findings suggest that de facto segregation may exist within nursing homes because better performing nursing homes may selectively admit residents based on race and/or payer status, preferring private payers over those using Medicaid, whose users are disproportionately minority group members. Another reason for the segregation may be due to the fact that Black nursing home residents generally choose facilities within their communities. “As policy makers develop initiatives to improve overall quality, they also need to incorporate solutions that will mitigate racial and ethnic disparities in nursing homes,” says lead author Latarsha Chishom, Ph.D., assistant professor of health management and informatics at the University of Central Florida. She and her colleagues note that the percentage of minorities among those 65-and-older in the U.S. is predicted to rise from 20 percent in 2010 to 42 percent in 2050. And, they add, current efforts to improve the quality of healthcare in part through pay-for-performance approaches may, in fact, aggravate racial disparities in nursing home care. Better-performing institutions may be better situated to reach quality targets and reap the benefits of these schemes, relative to lower performing ones that mostly serve Black residents, say the authors. The researchers examined 1999-2004 data from 11,472 U.S. nursing homes. They studied financial performance measures including profits, revenues, costs and percentage of Medicaid residents. Quality variables included nursing-hours per resident per day, bedsore prevention, and total catheter use (which is associated with more infections). 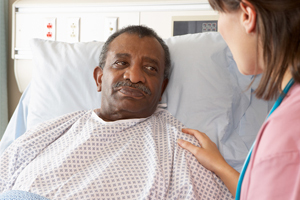 This research reveals that Blacks’ reliance on Medicaid, as opposed to private payment plans, leads to being “shunted into less desirable nursing homes,” comments David Barton Smith, Ph.D., professor of health management and policy at Drexel’s School of Public Health. He notes that most researchers in the nursing home quality improvement field have ignored the selective sorting of residents and have unrealistically blamed management, health workers, or patients and their families for disparities in quality. “No one wants to or knows how to do anything” about the differences in reimbursement by payer that leads to selective sorting, Smith says, adding that the field has avoided acknowledging “the naked differences in dollars” available to predominantly White versus predominantly Black facilities. Predominantly Black nursing homes lack funds from other payers, philanthropy, endowments and investment income to overcome Medicaid shortfalls. They thus have fewer resources for staffing, training and quality improvement efforts, state the study authors. Acknowledging difficulties in increasing Medicaid payments overall, the authors suggest that the government might direct increased Medicaid reimbursement rates towards nursing homes with a high proportion of Medicaid recipients, among other efforts.